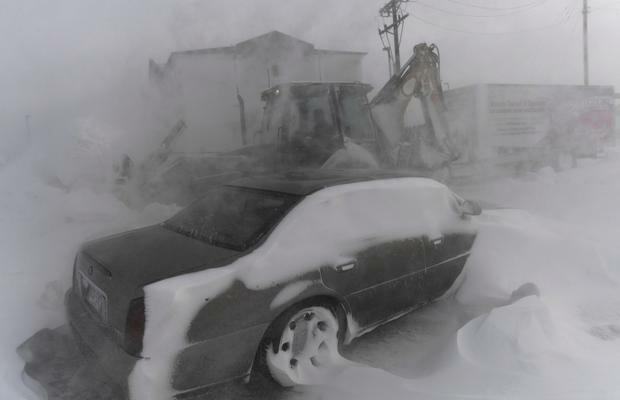 A “bomb cyclone” blizzard, the second in a month, hit the Rockies on Wednesday and spun into the U.S. Plains and Midwest, bringing fears of more flooding in areas still recovering from last month’s deluge. Warm spring temperatures on Tuesday, upwards of 80 degrees Fahrenheit in Denver, gave way to frigid 20s, heavy snow, gale-force winds and life-threatening conditions, the National Weather Service said. Wind gusts upwards of 100 mph were reported Wednesday in eastern Colorado, Hurley said. Denver International Airport reported that about half its flights, 755, were cancelled Wednesday and into early Thursday, but all runways remained operational. Residents throughout the north-central United States could expect downed trees, widespread power outages, road closures and treacherous driving through Friday, the NWS said. More than 10,000 homes and businesses were without power in South Dakota early Thursday, according to the tracking site PowerOutage.Us. In March, another “bomb cyclone,” which involves a rapidly intensifying cyclone, triggered heavy rain over the region and combined with melting snow to cause flooding along the Missouri River and its tributaries. More than $3 billion in damage was done to property and crops in Nebraska and Iowa alone. This week’s storm will keep dumping snow on parts of Colorado, Wyoming, South Dakota, North Dakota, Minnesota and Wisconsin throughout the day, meteorologist Hurley said. That snow adds to the woes of the Midwest farmlands, which in recent weeks saw record flooding that washed out crops and drowned cattle. “All that snow is going to melt sooner rather than later, and it’ll all flow into the Missouri River basin,” Hurley said. The weather system is expected to weaken and move to the Great Lakes area on Friday, bringing rain and snow to that region, the Weather Service said.